How do you organize your life? Do you bounce from calendaring system to calendaring system or planner to planner but eventually come to the conclusion that none of them quite fit your needs? Have you switched completely to a digital calendar but still miss the experience of paper planning? I have the answer for you. You laugh… but stick around. There is so much you can do with a simple, inexpensive notebook to organize your life and focus on the things that matter most to you. I’ve always kept a calendar, from the time I was a teenager. I used babysitting money to buy a $60 Franklin Planner when I was 16 and I’ve used everything from a paper school agenda to a palm pilot to a cheap day planner from Target. For several years I relied exclusively on my digital calendar but I always found that eventually, I would spiral into a cycle of disorganization. I need to write things out. On paper. There’s something about the act of physically writing that helps me commit my schedule to memory, that connects me to my goals and plans. At this point, I’ll always keep a digital calendar and master to-do list as a back-up and to sync up with my family. However, over the past two years, I’ve switched to planning things out daily on paper with just a plain Moleskine notebook. This notebook doubles as a journal, an idea book, a shopping list, a writing notebook, and so much more. I love it and it’s so nice having everything in one place. I hope it works for you too! Find a great notebook and pens you love. You want paper that feels good and won’t bleed through and you want the notebook to be small enough to carry everywhere but big enough to have room to map out your time. Then pick a couple of pens you like in contrasting colors. I’m a bit of a freak about the perfect pen and lately, I’ve become a fan of these gel pens or these fine felt tip markers. I need it to feel smooth and flowy when I write. 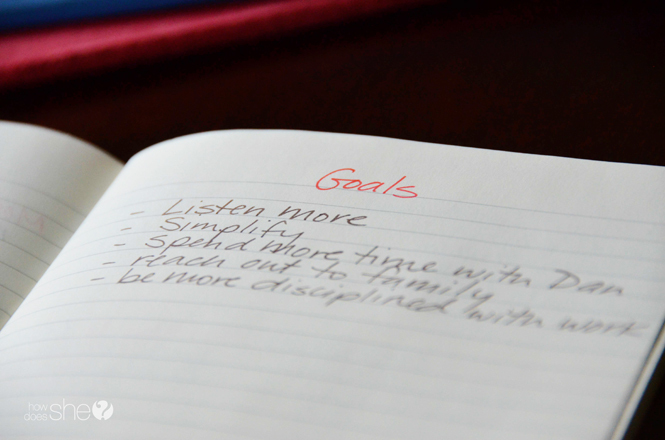 At the front of the notebook, write the things you like to accomplish in a typical day. 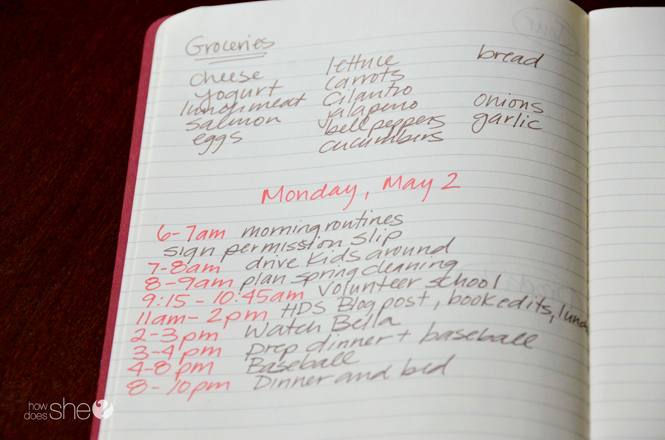 Think of these as routines for organizing your life. If you were the perfect ideal version of yourself, what would you do from sunup to sundown? We all know that at sundown, you hit the couch with a bowl of popcorn and a middle-grade novel. It’s okay to admit it. Think of this as your baseline, not a firm schedule that must always be adhered to. In fact, I rarely accomplish all the things on this list in a single day, but having a structure, a goal to shoot for helps me improve. You will go back and look at this list weekly and can choose to schedule specific tasks to help become the woman you want to be. Another fun idea is to write one of these at the top of each day’s page and read it each time you look at your notebook. 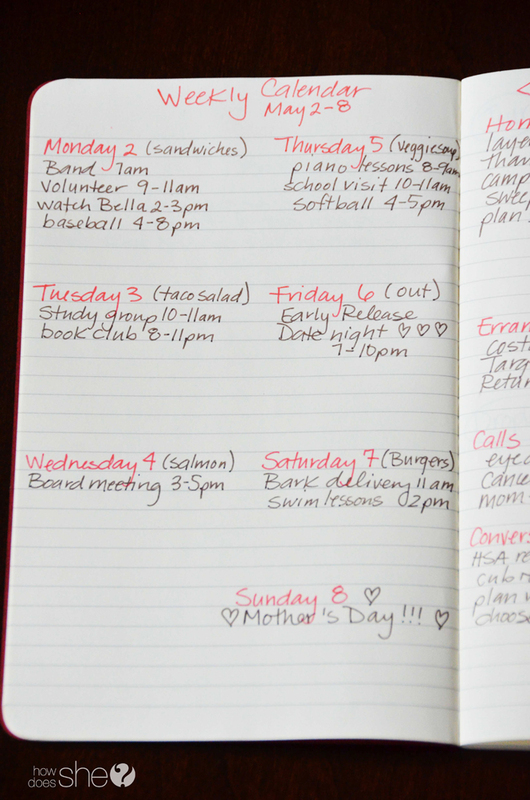 Create a page where you write down all the days of the week and what you typically like to get done on those days. For example, on Tuesdays, I should really prepare for the kids’ Wednesday baseball practices. On Wednesdays, I need to bring in the milk. I like to plan meals and grocery shop on Mondays. You are not locked into any of these but making a list of what weekly tasks you’d like to do each day is an easy start to organizing your life. 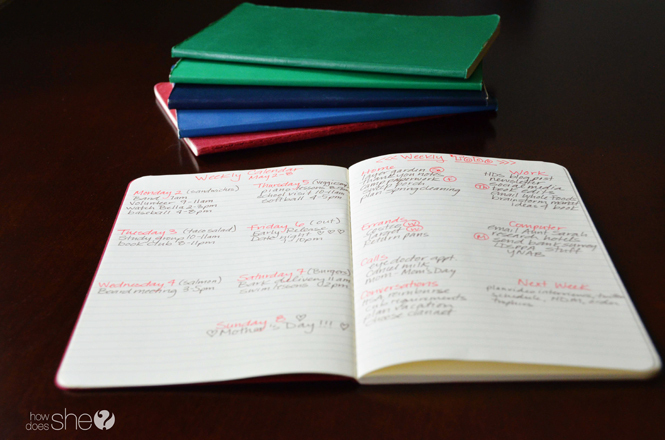 Choose a time once a week to host a meeting with yourself to plan for the week. Open your notebook to two blank facing pages. On the left page, use your colored pen to write the day names and numbers of the days of the week. I start my week on Monday and have Sunday wrap up the week. You choose. How about starting your week on Wednesday, just because. On each of the days, copy the event names and times from your digital calendar. 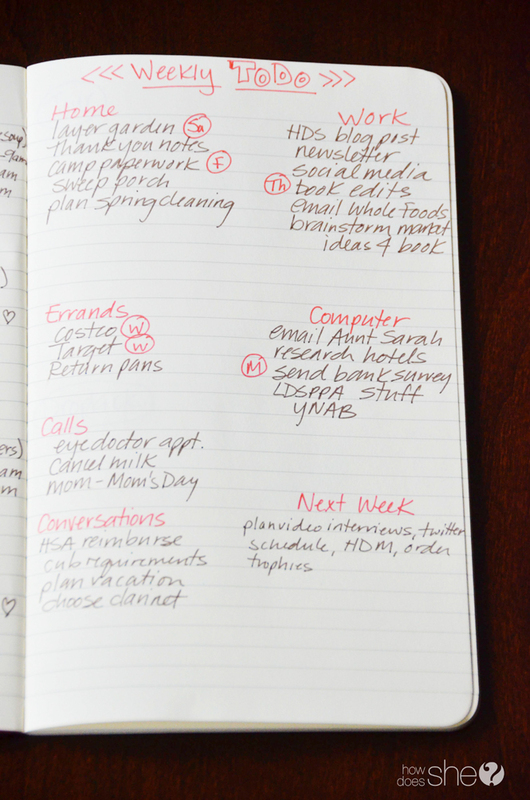 On the right page, create a weekly to-do list with seven headings written in colored pen: Home, Errands, Calls, Conversations, Work, Computer, and Next Week. These categories are for things to do at home, errands you need to run, phone calls you need to make, tasks you need to do that involve other people, tasks to complete for your job, computer tasks and things to do next week. The “Next Week” category is a great place to write things you want to add to your to-do list soon, but you can’t get to them this week. Write down everything you want to accomplish for the week under those headings so you can group like-items together. Be realistic about what you think you can accomplish. Use your calendar items on the opposite page to nudge you along. If you have a PTA meeting on Wednesday, you might want to add “type agenda for PTA meeting” under the Computer heading. Similarly, if your son is attending a birthday party, write “birthday gift” under errands. If any of these items must be done on a specific day, write the first letter of that day with a circle around it next to the item. However, if it doesn’t have a rock-solid deadline, don’t pin it down to a specific day yet. This is also a good time to consult your list of aspirations and see if there’s anything you can do this week to further your big picture goals. This may be the most important tip in this post. Do not start writing a daily to-do list until you’re clear about what your day looks like. Each morning, start a fresh page with the date up top in colored pen. Next, use a colored pen to divide your day into time chunks. After you’ve written your calendar items down, your day should naturally break itself up into chunks of time. The time after you wake up but before you get the kids out the door to school, the time between getting the kids out the door and getting yourself to work or getting your younger kids down for a nap. There’s a slice of time during your lunch break or after work before dinner. You have another chunk of time after the kids go to bed but before you dissolve into a mush-brain in front of the TV. So write down those chunks for this specific day. Use your weekly calendar to break this down. And be realistic. If you have a doctor’s appointment from 10-11, map out a time chunk from 9-9:30 to get ready and from 9:30-10 to drive to the doctor. You get the idea. Then, add items with that specific date from your current week’s To-Do list and from your “typical week” list into the time chunks. As you add items, write how many minutes you think they will take to accomplish. Very quickly you will find that you typically have WAY more items on your weekly to-do list than you can possibly complete. However, when you only add items from your to-do list onto your calendar in specific time chunks, you won’t feel so bad. It’s not your fault that the days are so dang short. You only have a finite amount of time and, with this method, you will only add as many tasks to your day as you can conceivably complete. If you find that you are unable to complete everything on your list week after week, you’ll need to re-evaluate your expectations. What do you need to drop out of your life so that all the pieces will fall nicely into place? Hopefully, you’re following along in your notebook throughout the day, re-evaluating and rearranging. At the very least, look over your list at the end of the day, see how you’ve done, transfer items to the page you have set aside for the following day, and look at tomorrow’s schedule. That’s the basic system. It’s simple and easy and when you do it, you have more peace in your life. Here are a couple of additional things to keep in mind. If you have a thought that you might possibly need for later, write it down in the notebook so you don’t lose it. I record book ideas, text for emails, journal entries, grocery lists, and much more. Next to each type of entry write a symbol so you can recognize it easily and transfer it to it’s final resting place once the notebook is full. J with a circle around it for journal, EB for e-book content, etc. I also keep a master task list at the back of the book for all of the things I’d like to do but can’t get to in the current week. If it has a due date, I write that next to it. As I’m planning my week, I refer to this list as well. Don’t say yes to anything unless you write it down. Keep your notebook handy as you’re responding to email. If you say, I’ll bring a snack tomorrow, add that to your current week to-do list with a date beside it. If you say you’ll bring a snack on a Wednesday three months from now, put a reminder on your digital calendar so you’ll remember it when that date finally rolls around. Writing on paper helps you look and feel more engaged in the real world. I spend so much time on the phone and on the computer that I look like a hypocrite when I tell my kids to put the screens away. Writing for a deadline, planning my schedule, playing Minecraft? It all looks the same to my kids. A screen is a screen is a screen. So, planning my day in a notebook is a nice change. Good luck! I’d love to hear how this goes for you. Staying organized is essential to being both productive and…well…sane. 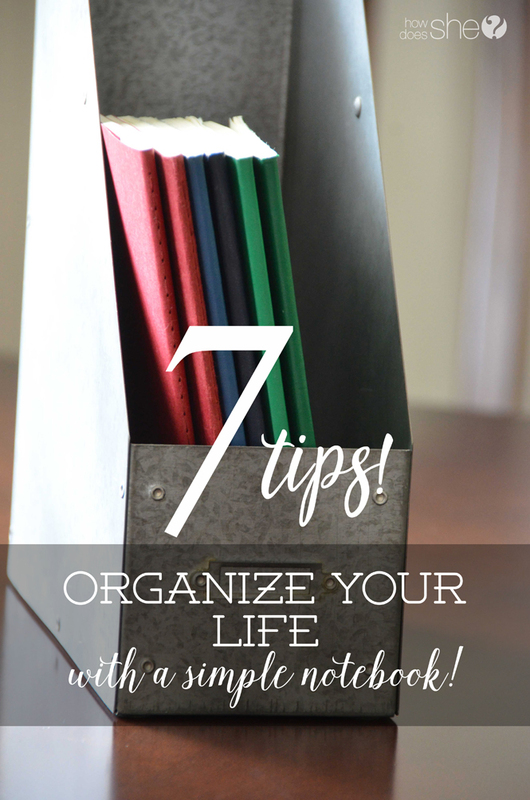 Check out a few more of our favorite tips to keep organized and sane all at the same time! I love your poppy bag! Where did you get it? What brand is it? Thanks! I love it too. I found it at Marshalls a few months ago. It’s Franco Sarto. Love this idea! I am the same way when it comes to pens and I have an entire plastic container to prove that I switch my writing interests often ? I’m trying to get into the swing of the notebook thing. When I do it, it works well. But then, as you noted life gets in the way and I let go…which I shouldn’t. After reading your ideas, I want to get right back into it. I thought I would keep one for work and one for personal. The work one tracks meetings, projects and notes from meetings. The personal one for my personal goals. But, since work takes up most of my week days, I guess keeping it all together makes more sense. Maybe different color ink will help me recognize the difference between the two types of entries. I feel you! My pendulum swings wide between organization and chaos. I’ve been much more consistent with this than anything else though so I’m pleased with it. My favorite thing about it is having one book for everything. It seems a little crazier, but I really love never wondering where I wrote something down. Some readers on facebook were suggesting using the bullet journal technique, which looks awesome too. One thing I like about that method is that you keep a table of contents in the beginning and you number the pages of your notebook. That might help if you’re using it for multiple roles in your life. I have been meaning to start something more organized for keeping track of things. I am a list writer, so I usually have a small notebook that I write lists of things in, but I am not always good about keeping up with it. Right now I am on a quest for the right notebook. Thanks for the tips! I look forward to trying it out. Tell me how it goes for you or if you make any great breakthroughs. I love learning from what everyone else is doing and adapting. Sometimes changing things up helps me keep on it. Great post! Can you tell me what handbag that is in the pic? Adorable! Thanks! It’s Franco Sarto – I found it at Marshall’s. I love this idea, Kathryn. I use notebooks for everything (finances, notes on podcasts, notes on books I read), but I still do need a planner. As a therapist/coach I have to plan my client’s appointments sometimes a month or two in advance, and having a calendar that’s already laid out with dates is really helpful to me. Thank you for sharing your system in such an organized way! I’m actually going to contact you via email to ask about using a tip from this post in a project I’m working on. Thanks again! I’ll be in touch. Thanks! I LOVE this system! I have been using a plain composition book I pulled from the kids school stash! I have used glue dots to put a printed monthly calendar on the first page for every month. Helps me to have a clearer vision on upcoming planning. Then I have weekly pages. On one side, everyday is laid out, on the other I have “blocked” sections for groceries, to-do, weekly menus and so forth. Then I have a couple pages between months for doodles, journaling, pictures colored by my kids (mom’s day gift) and anything else I think I need! I glue stuff, tape stuff, color stuff and I stay organized! I would love to see pictures of your notebook as a reference if you don’t mind sharing ? I have “multiple personalities” with roles in church, a military wife, a homeschooling mom, etc. I love this idea of combining digital with paper. One question I have though is what do you do with papers you get from meetings that you refer to often for your to do list for said roles? Do you add them to your digital “files” or clip them into your notebook or perhaps have some other way of handling them? I purchased a small three ring binder (size of a half sheet of paper) a few years ago so I have tabs for each role and can add paper as needed (and remove paper as needed) but I use it more for taking notes for what needs done for those roles or notes during meetings, etc. I would love to hear what you do with organizing papers related to your roles! I am just setting up a mini binder for my tasks/notes jounal. I found some pocket dividers at Target for mini binders so I can put loose papers in it. They will fit a whole sheet folded in half, and there are pockets on both sides. They also sell mini sheet protectors. If I need to keep something long-term but don’t need to reference regularly, I plan to scan it into Evernote. I use a notebook! I love it, I have one with pocket dividers. I can hold coupons, notes, receipts etc, so everything is in one place when I am out running errands. My set up is a little different, but this idea is awesome and it works!! Where did you get the notebooks that you use? Never mind, I found the link when I reread the article . Thanks! How do you separate the weeks so that you can find your current week easily? You could use a paperclip to mark your page, or you can buy sticky divider tabs that you can write-on to have different sections. I am excited to try this for myself. Will you please post more pictures of the different pages you create? This is basically the Bullet Journel system started by Ryder Carroll. I started one a month ago & love it. Find a dotted Leuchtturm works better for me than the Moleskin. Yay! I found it. This looks like such a great way to get organized. I am definitely trying this. Maybe it will help me stay organized with primary stuff too 🙂 Thanks Kathryn, you’re awesome for teaching and sharing your amazing ways! So this is all for week one..is week two just a repetition and so on and so on..same 10 pages every week, right? Just want to make sure I understand the formatting..I’m an avid paper planner person but find myself with multiple planners and I’d like to say with just one for everything. I love this! I have been one who hasn’t had much luck with “planners” but I’ve soooo wanted to get in on the fad because I love the fancy pens and how cute everything looks. I tried the bullet journal for awhile, but I soon realized that all I need/want/use is a plain notebook where I can just keep track of everything in my brain. I like the way you suggest to write down all weekly tasks and then keep a modified “calendar” of day-to-day schedules. I’m going to try this. ❤️This notebook idea! I’ve spend countless dollars on planners that never seem to have enough space in the boxes…just not fitting my needs. This is a perfect way to have exactly what you need all in one place! I love it and I’m going to try this method for my bookkeeping business…tracking all my client workflows! I’m excited 😊 thanks!!! Can you tell more and show us how you do it with some examples? Or maybe do you have already written something? Yay – I am a paper notebook girl, too! I do still keep a large paper calendar where I write down everything by day (i.e., trumpet lesson, basketball practice, bring home permission slip, turn in lunch money, etc.) Every night before bed, I spend 5 minutes transferring the next day’s appointments/to-do list to my spiral or composition notebook so that I can see what’s on the next day’s agenda. My husband is usually right there, so that’s when I’ll ask him what his schedule is if we need to coordinate picking up the kids or something. On my daily list, I put an asterisk next to anything that needs to be done in the a.m. so that I see that first thing in the morning. Those are usually morning appointments or morning reminders I give the kids (i.e., bring your science book home, don’t forget to stay after school today.) I rarely (almost never) miss something and try to cross everything off my list by the end of each day. I also jot down miscellaneous things like you do – vacation ideas, thoughts about this and that, books I want to read, etc. I appreciate you taking it to the next level – weekly and monthly tasks, future aspirations and goals – love that! Thank you! !